A Checklist for getting"Out and About"
Looking for some great field trip tips? This easy checklist makes sure you remember all the essentials. Take the ages and personalities of the children into consideration when planning a field trip. While most children will have no problem visiting the local supermarket, other trips may not be suitable for some children. My four year old grandson, for example, is easily frightened by loud noises and covers his ears. A trip to a loud factory would be too scary for him. Make certain there are enough adults present on the trip. For preschoolers there should be a ratio of one adult for 2-3 children. Will you be walking, and what routes will you take? Will you take a bus? Make sure you know which bus and whether there will be a transfer. Are you planning to use your own vehicle? Check with your insurance company to make sure you are covered. What type of trip are you going on and what time of year is it? Will the children need to bring or wear certain types of clothing? Will light jackets be needed in case the weather turns cooler? Some places do not allow sandals to be worn. Have you checked the policies of the place of interest? If the field trip will extend into lunchtime, can you bring your own or will you be eating at your destination? Is there a place to store your lunch until mealtime? Make it easy to spot the children in your care. Buy oversized T-Shirts in a bright color they can slip on over their regular clothes. If all the children are wearing the same color, it will make it easier to keep them all together. Another great field trip tip is to consider using wristbands (tough for small children to remove) in the event a child is separated from the group. Make sure the name of your day care and your personal cell phone number are on the wristband. Looking for a place that sells wristbands for this purpose? Try www.wristbandfactory.com. They sell great wristbands at a low cost. Don’t forget to schedule bathroom breaks and free play for longer field trips. A First Aid kit and all of the children’s emergency information. An easy field trip tip: put the emergency information on laminated index cards placed in the First Aid kit. A camera to take pictures. Water bottles (labeled) for each child. If you will be traveling with very young children, a stroller will come in handy. Make sure you have signed field trip permission slips from every parent before you go. Have trouble getting out due to the ages of the children in your care or do you live in a remote area? Consider field trip alternatives. 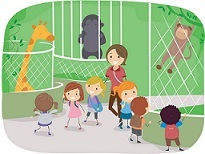 This is a great way to bring the field trip experience "into" your daycare. Last, but certainly not least, enjoy the experience. The look of happiness and awe on children's faces when they experience something new is, after all, the whole purpose of the trip.